In July and August, the vibrancy of Mexican cuisine will spice up the Lobby Lounge. 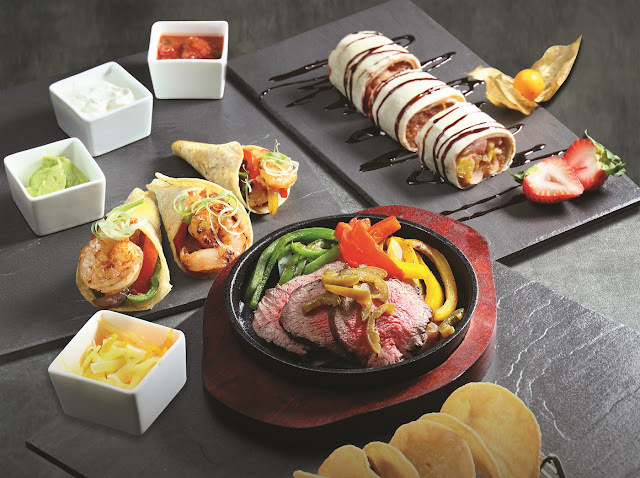 Our chefs present six varieties of delicious sizzling Fajitas, including classic and creative choices. Classic Steak Fajitas is an irresistible combination of perfectly grilled and juicy Angus beef steak seasoned with jalapeno, red onion and cheddar cheese, paired with crispy taco shells. Another traditional favourite is the Chicken Fajitas, featuring succulent marinated chicken breasts served with seared onion, bell pepper, white mushroom, cherry tomato and jack cheese, wrapped in warm flour tortillas. In addition to the savoury classics, the chef has created fresh and sweet choices for guests. Fruit Fajitas uses the finest seasonal fresh fruits, including apple, blueberry, pineapple and orange. Hot chocolate is drizzled on top for an indulgent balance of sweet and sour flavours, making it a refreshing finish for a summer meal. Other Fajitas options to try include King Prawn Fajitas, Veggie Fajitas and Banana Fajitas. The Fajitas Feast menu is priced at HK$198 each and is available daily from now until 31 August 2018 during the dinner period at the Lobby Lounge of Marco Polo Hongkong Hotel. For enquires or reservations, please call 2113 3919.